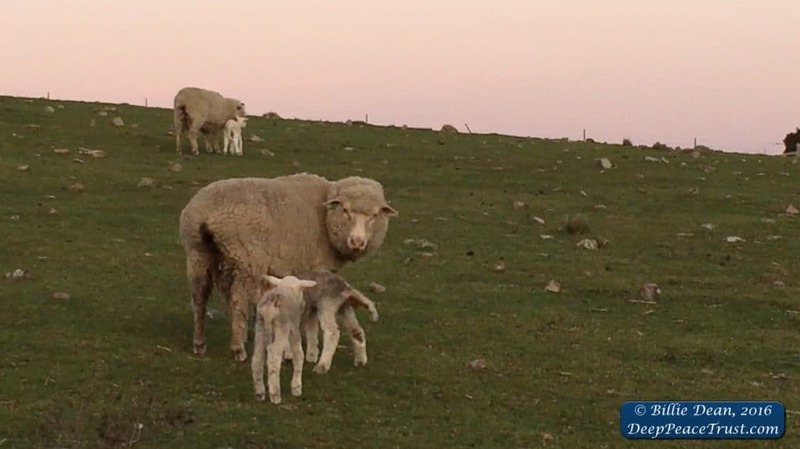 My phone rings: “Mum quick, a mother sheep needs help giving birth!” I grab towels, my birthing medicine kit and a bag with sterile gloves and everything else I need to be a sheep midwife. I pop dogs in the car and drive into the special maternity paddock we have created. Would the baby be alive? Will there be more than one? Will it be presented the right way? Will we be able to get the lamb out? Will the mother and baby bond? So many questions. Once again, Tam holds the mother, speaking soothingly to her. I give her rescue remedy and homeopathics for birthing, and Andrew and I slide a new and very large baby onto clean towels. I am so grateful for Andrew’s strength. Making sure the baby can breathe, we move the little one to the exhausted new mother’s head, placing him or her in front of her. A little bleat and the mother washes the baby and we know they are going to be okay. Some of them take a bit longer to bond. And those we bring down to the house to make sure they are all well. Its been like this for two weeks now. Exhausted, covered in afterbirth, blood, manure and hay, the three of us working around the clock to ensure that all our mothers and babies are okay. As a sanctuary we don’t intentionally have babies. We are not “breeding to sell”. But this was the work of a local ram without us knowing or even seeing him. A ghost ram who snuck in after dark for a wild frisky night with all the girls in our 200 rescued sheep flock. It came at a time of the super full moon, solar flares, and a dog with a super high fever. Suddenly, lambs — everywhere! Intense. The babies will stay with their mothers forever, and perhaps that kind of peace is needed in the upper realms, or for those souls. To be born without fear is a beautiful thing. And for the mothers also to know they will never lose their babies to a grizzly death. There is much peace in that. A peace some of us take for granted. It wasn’t that long ago that humans stole the children of other humans, although not to eat. In some areas, it still happens that families are ripped apart because of a lack of understanding and compassion in this world. Because humans discriminate. The “lambing season” was heart-tugging for us. Over 40 more mouths to feed and house. And two weeks of lost office time as we worked with the sheep people day and night. The sheep mothers are excellent. They didn’t leave their babies, even for hay. So we created a special mum’s paddock, which is sheltered and closer to the house. With over 200 rescued sheep, bringing them down the hill was no mean feat. The mums and babies all hung back, not wanting to go with the main crowd, and Tamsin had to help a couple of the little ones across some water. We checked them all through the night. And then the next night. And the next. Mabel and her daughter Annabelle ripped our hearts — we tried so hard to save them. And then there was Paddy. Paddy shattered my heart. I was on my way to bed in the wee hours when I felt I should really go check on the sheep mothers. It was bout 3 am. I heard him crying, but their song is something we hear all the time living next door to a sheep and cattle farm. However, there was no answering call from his mum. So I got out of the car and went into the paddock, listening, following the call. I found him distraught and on the wrong side of the fence, not far from a steep fall down into the creek. He was calling me to help him, staring right at me. I picked him up and his sister ran over to greet him, happy I had come, and happy he was safe. I looked around for his mum. She stared at me and called. The little girl ran to her mum, but Paddy’s back legs weren’t working yet. He was shivering and wet from the rain. The mum left him for me to take care of. I scooped him up and dried him off. I stayed up all night with him, offering him the precious colostrum from a sheep lady I’d had to milk the day before. For the day, he did the chores with us in the car, winding his threads of love and sweetness into my heart. And that night he slipped away on a sigh in his sleep. I wondered at the world. These lives are so precious, so unique and special. The lamb people are intelligent and kind, cheeky and loving. 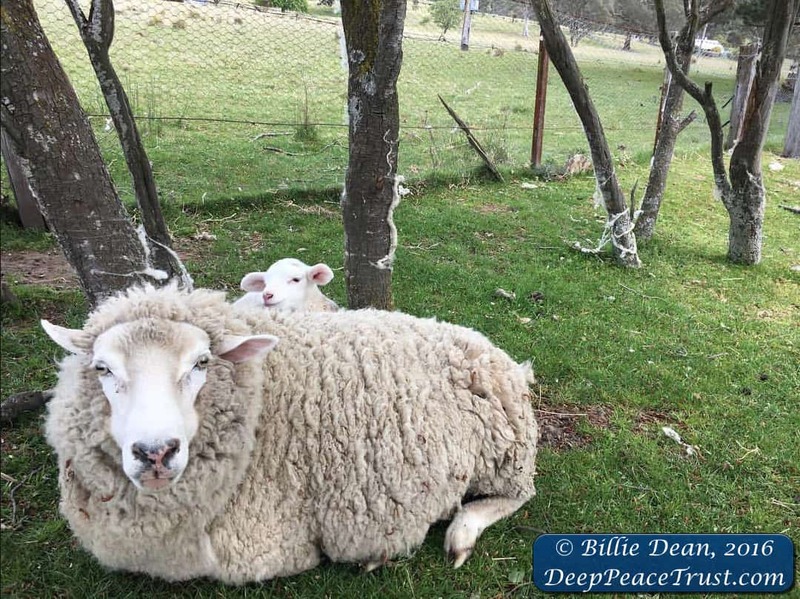 You should have seen this tiny newborn lamb come over and cuddle her brother. You don’t need to understand their silent language to see how relieved she was, and the look she gave me was pure gratitude. Such intelligence for only such a short time born. So how come humans rip these tiny beings from their loving mothers? And send them to their terrifying death so humans can feast on their flesh? The suffering they must go through. Our tender hearts were stretched these past two weeks. The sheep people stole our hearts and our focus. The three of us worked around the clock checking them, bringing the ones in need down to the house paddock, checking, helping, treating, assisting — hearts stolen. We were up to our necks in the messy part of life — life, death, no sleep, and our beloved rescue dog Maeve suddenly showing an abnormally high temperature. No vets. Not even a phone to ring a vet, as they were working on the cell tower in town at that time. But the good news that we did find a vet. We did take her in. And she did return to health. Talk about intense times. Breathe, ground — one crisis at a time. Stay centred. Forty lambs later (there may be more to come! ), we haven’t been able to spend time in the office for two weeks to do our work, but mothers and babies are healthy, safe and settled. And that’s the important thing in our world. Tonight, I will light a candle for Paddy, Mabel, Annabelle, and the others who didn’t make it. I feel for the mothers who lost their children and cried for them. I feel for the child with a human and dog family to raise him. But the others are all safe at A Place of Peace. They will always live with their mothers and friends. They will never know anything else but peace. And the freedom to be their wild, authentic selves. The real sadness comes from knowing the truth of what happens to other sheep out there. The children we have are “meat sheep”, the cheeky ghost ram being of a breed used for “meat’ rather than wool. Because humans discriminate. They think our species is superior, that it is okay to take innocent, vulnerable, beautiful children away from their mothers. They think it is okay to kill. But not at our place of peace. Not at our sacred sanctuary. Now that the birthing season is over, Andrew and Tam and I will have to rethink shelters and land, grazing and hay. All because a farmer let loose his ram to create more “meat” in the world. A friend recently told me that his dad used to feel sorry for the lambs as they were sent off for slaughter. But not enough to stop doing it, because the cheques he got back were so good. Because the meat industry tells us eating babies is a good thing. Good for who? Let’s be clear. Lamb chops are from someone’s baby. A baby who never got to grow up, leaving his mother grieving. 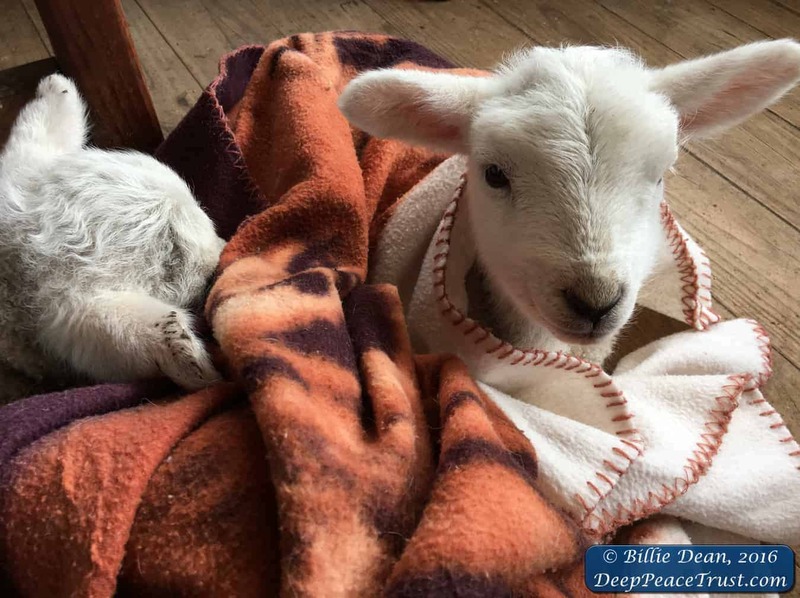 Please join us in living the path of compassion and kindness, the path of deep peace for all species. Let kindness ripple out into the world. Support Jake with a gift of kindness over in our shop, or all the animals at A Place of Peace by making a monthly, weekly or one-off donation. Thanks for being wonderful! Why Is Wyld Shamanism Important? Why Aren’t More Spiritual People Vegan?